Similar to an old school Boarder Can effect, the Flashback 4 is a set of two 4-bank LED fixtures that fold up into a rugged hard case. Great for mobile entertainers on the road, the Flashback 4 fixtures each have 1x green, 1x blue, 1x amber and 1x red cluster of 36x 10mm LEDs that flash, strobe and chase back and forth and bring pure lighting excitement on a stage or dance floor. 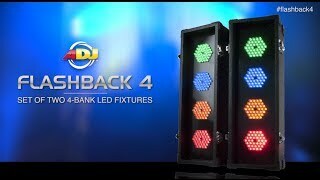 Easy to set up and take down, the Flashback 4 has 11 exciting built-in programs, or run the fixture in sound active mode. The fixture has a beam angle of 45-degrees, and has a low power draw of only 23-Watts. The rugged hard case makes it ideal for transporting and storing the Flashback 4. Considering purchasing the American DJ Flashback 4? Have questions? Ask people who've recently bought one. 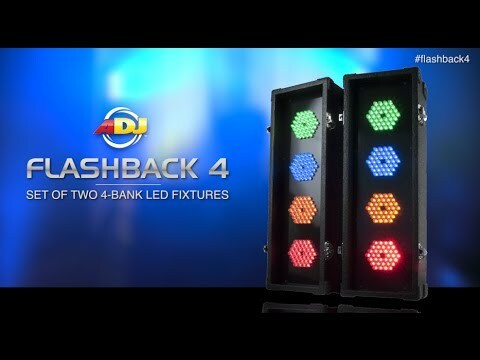 Do you own the American DJ Flashback 4? Why not write a review based on your experience with it. Seen a video for American DJ Flashback 4 online or have you own video? Check out American DJ Flashback 4 on DJkit.com!